Well, this was inevitable. A Tolkien fan — less enthused by Peter Jackson's expansive, three-movie adaptation of The Hobbit than others — has created his own edit of the trilogy, trimming the 9+ hour-long saga into a much trimmer four hours and 21 minutes. Check it out! • The investigation of Dol Guldor has been completely excised, including the appearances of Radagast, Saruman and Galadriel. ... Like the novel, Gandalf abruptly disappears on the borders of Mirkwood, and then reappears at the siege of the Lonely Mountain with tidings of an orc army. • The Tauriel-Legolas-Kili love triangle has also been removed. Indeed, Tauriel is no longer a character in the film, and Legolas only gets a brief cameo during the Mirkwood arrest. • The prelude with old Bilbo is gone. 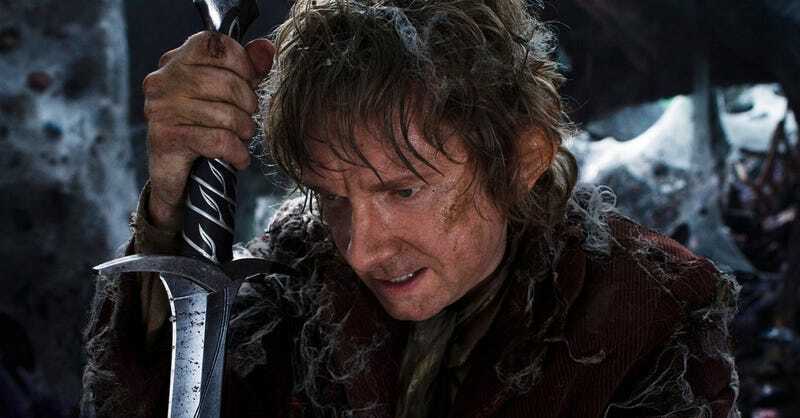 As with the novel, I find the film works better if the scope starts out small (in a cosy hobbit hole), and then grows organically as Bilbo ventures out into the big, scary world. • Several of the orc skirmishes have been cut. I felt that the Battle of the Five Armies provided more than enough orc mayhem. If you pack in too much before then, they just become monotonous, and it lessons their menace in the audience's mind. • A lot of filler scenes have been cut as well. These are usually harder to spot (and I've probably missed a couple), but once they're gone, you'll completely forget that they ever existed. For example, the 4-minute scene where Bard buys some fish and the dwarves gather up his pay. Works for me! Actually, I bet like another enterprising fan editor can get the trilogy down into a single, three-hour, perfectly watchable movie, but this seems like a noble start. You can get more details — and watch the Tolkien Edit itself — at TolkienEditor's site here.